LONDON — The Air Force on Tuesday awarded a $3.9 billion contract to Boeing for two next-generation Air Force One planes. The fixed-price firm award follows a February handshake deal between President Donald Trump and Boeing CEO Dennis Muilenburg to cap the program at that figure. A Defense Department contract announcement labels the award a “definitized contracting action” — the label given to contracts where the exact terms have not been specified — and obligates $64 million at this time. A statement from the White House claims that the deal will save taxpayers more than $1.4 billion from “the initially proposed $5.3 billion cost-plus contract.” However, Defense News and other publications have challenged that figure, which hasn’t been substantiated on any public documentation estimating the cost of the plane. Trump himself tweeted that the cost of the program was around $4 billion in December 2016, when he called for it to be canceled if programs did not come down. Experts and Air Force sources at the same said that figure appeared to hue closely to their estimates. Then in February 2017, he claimed that he had shaved $1 billion from the program — an entire year before the $3.9 billion handshake deal had occurred. Air Force officials, who are officially responsible for contracting for the new planes under the Presidential Aircraft Recapitalization program, have affirmed that some requirements have changed, such as a specification for mid-air refueling that was cut. The service was also able to reduce cost by buying 747s previously built by Boeing for a now-bankrupt Russian airline that never accepted the planes. The new Air Force Ones will be two heavily-modified Boeing 747s equipped with a host of sensors, electronic warfare equipment and other defensive measures that turn the jets into uber-protected, flying White Houses. Boeing is expected to begin work on the planes in 2021. The White House said in a statement that both aircraft will be delivered by 2024. Though acquisition wonks will likely continue to puzzle over the nature of the Trump-Boeing deal, the president took to CBS News on Tuesday night to talk about a topic of more general interest: Air Force One’s paint scheme. "Boeing gave us a good deal. And we were able to take that. But I said, 'I wonder if we should use the same baby blue colors?' 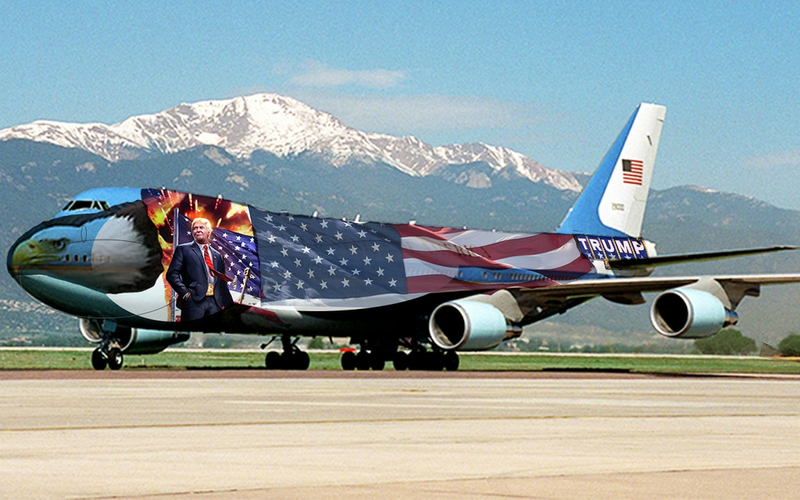 And we're not,” he said on the show, adding that the new planes will be painted red, white and blue instead of the iconic blue and white scheme chosen by former First Lady Jacqueline Kennedy in the 1960s. “It’s going to be the top of the line, the top in the world. And it’s going to be red, white and blue, which I think is appropriate,” Trump added.